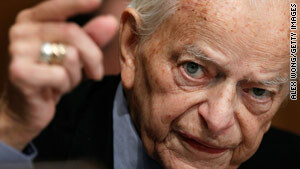 Sen. Robert Byrd threw his support behind the plan after he secured a 60-day delay for the repeal to take effect. Washington (CNN) -- Initial votes on a proposal to repeal the "don't ask, don't tell" policy could occur Thursday in the Senate Armed Services Committee and the House. This vote would come a day after the proponents of the plan said they were able to secure the votes needed to get the plan past the important military committee. A recent CNN poll seemed to suggest that Americans were ready for the change. A CNN/Opinion Research Corporation survey released Tuesday indicated that 78 percent of the public supports allowing openly gay people to serve in the military, with one in five opposed. Another key Democrat on the Senate Armed Services Committee on Wednesday endorsed the compromise plan. Sen. Robert Byrd, D-West Virginia, said he would vote for the measure after securing a change in the language that would delay the repeal for 60 days after certification of a military review by President Obama, Defense Secretary Robert Gates and Joint Chiefs of Staff Chairman Adm. Mike Mullen. "I did not want to blindly assent to repealing this law without giving the Congress an opportunity to re-examine the concerns of our Armed Forces and the manner in which they are being addressed," the 92-year-old senator said. Proponents of the repeal think Byrd brings the total of yea votes in the committee to 16. Fifteen are needed for passage. Byrd said he worked with Senate and House leaders, the White House and the Defense Department on the language. "This period of time will allow the Congress, along with the American people, to thoroughly review the proposed policy recommendations to ensure that these changes are consistent with the standards of military readiness, military effectiveness, unit cohesion and recruiting and retention for our Armed Forces," he said. Earlier, moderate Democratic Sen. Ben Nelson of Nebraska boosted the chances for the proposal to win committee support when he endorsed the amendment without the delay. However, the leaders of the four branches of the military said Wednesday in a letter to Republican Sen. John McCain and Republican Rep. Buck McKeon that they opposed any congressional action on the policy now, before the military completes its review of the matter. The proposed agreement -- reached Monday by the White House and top congressional Democrats -- calls for a repeal of the controversial policy after completion of a military review expected by the end of 2010, followed by the review certification. Byrd's compromise adds the 60-day delay. Gates gave lukewarm support for the plan on Tuesday, saying he preferred to complete the review before proceeding to the legislative repeal. The letters to McCain, R-Arizona, and McKeon, R-California, from the heads of the Army, Navy, Marines and Air Force said legislative action now would undermine the faith that service members put in the review process. "I believe it is important, a matter of keeping faith with those currently serving in the Armed Forces, that the Secretary of Defense-commissioned review be completed before there is any legislation to repeal" the policy, wrote Gen. Norman A. Schwartz of the U.S. Air Force. Pentagon spokesman Geoff Morrell said Gates' statement on Tuesday "speaks for itself, and obviously, so do theirs," referring to the letters from the military leaders. However, Morrell said that Gates' position was firm on backing the compromise being pushed by the White House and leading Democrats. Later Wednesday, Mullen's spokesman said the Joint Chiefs chairman also accepted the compromise language. "It appears as though Congress is preparing to take action now -- that's certainly their prerogative," said Capt. John Kirby, the spokesman for Mullen. "But because the proposed language also protects our prerogative to fully study this issue, consult with our troops and their families, and certify the results before any repeal could take effect, the chairman is comfortable with it." Nelson said in a statement he was convinced that Gates supports the compromise agreement. "I spoke to Secretary Gates, and he advised that while he preferred waiting until the study is completed, he can live with this compromise," Nelson said Wednesday. He said the compromise "shows that Congress values the Pentagon's review that will include the advice and viewpoints from our men and women in uniform, from outside experts and from the American people about how to implement the repeal. It rests ultimate authority to make this change with our military leaders. I believe this is the right thing to do." A spokesman for Sen. Joe Lieberman of Connecticut, one of the authors of the compromise, said backers of the measure were "increasingly confident" of its chances for committee approval. "This could very well be a historic week in the United States Congress," said Lieberman spokesman Marshall Wittmann. Lieberman, an independent, sits with the Senate's Democratic caucus. A CNN count gives the measure more than the 15 votes it needs to pass, including Byrd and moderate Republican Sen. Susan Collins of Maine. Supporters also believe Democratic Sen. Evan Bayh of Indiana, who is so far undeclared, might support the measure. On the House side, McKeon, the ranking Republican on the House Armed Services Committee, said Tuesday that he opposed congressional action before the military had time to complete its review. So does Mississippi Democratic Rep. Gene Taylor, who said that attaching the repeal amendment to the defense policy bill could doom the measure. Republicans will now likely vote as a bloc against the defense policy bill, which had bipartisan support in committee, Taylor said. So will some liberal Democrats who traditionally oppose the measure to protest government policy on Iraq and Afghanistan, Taylor said. But an aide to Pennsylvania Rep. Patrick Murphy, the Democrat tasked with rounding up votes for passage of the plan in the House, said Tuesday that he is "confident he will have the votes." The "don't ask, don't tell" legislative repeal plan emerged late Monday from a meeting at the White House involving administration officials, gay rights groups and Pentagon officials, sources told CNN. That process is well under way, the official said, noting that a survey will go out shortly to about 70,000 troops and families to solicit their views.